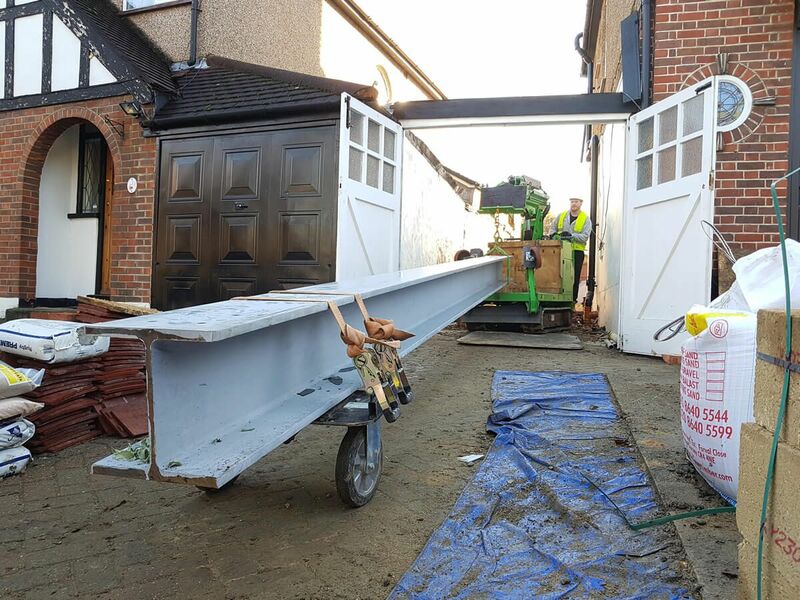 Another I-Beam access / installation challenge for the Hooka. 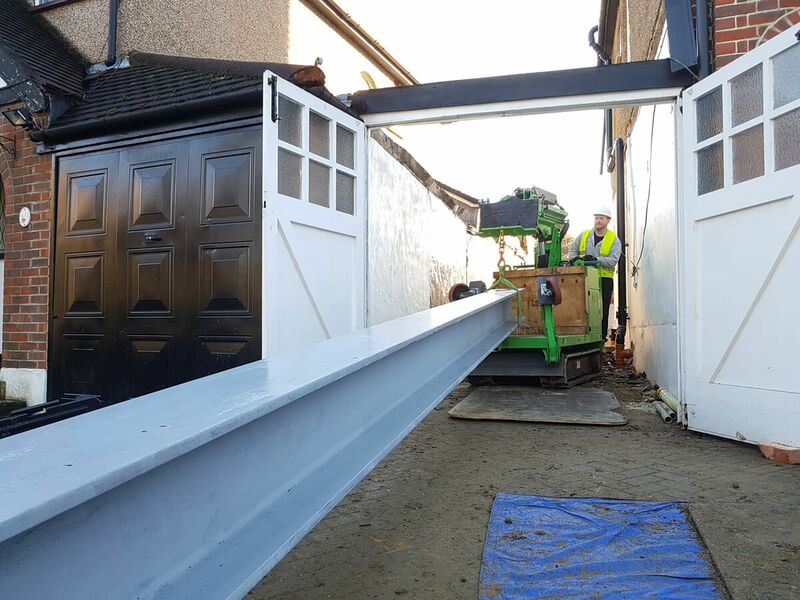 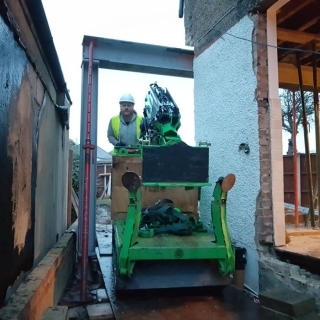 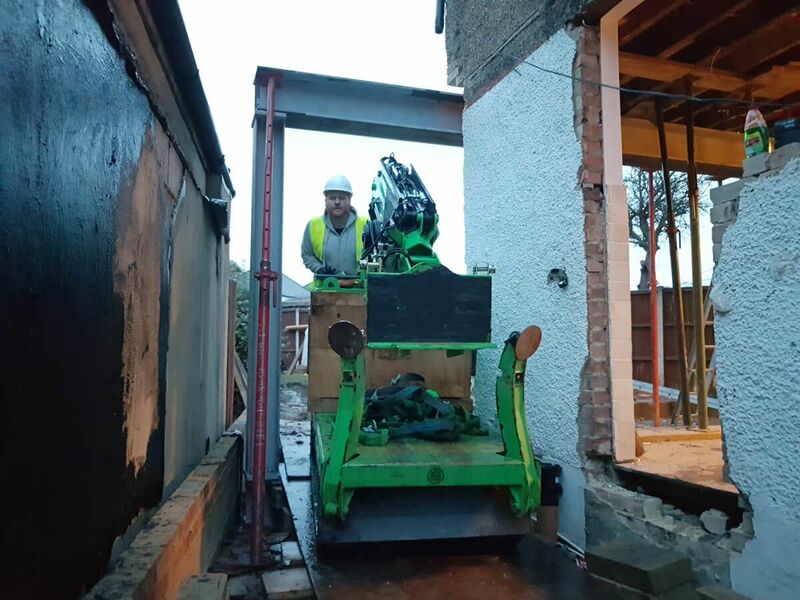 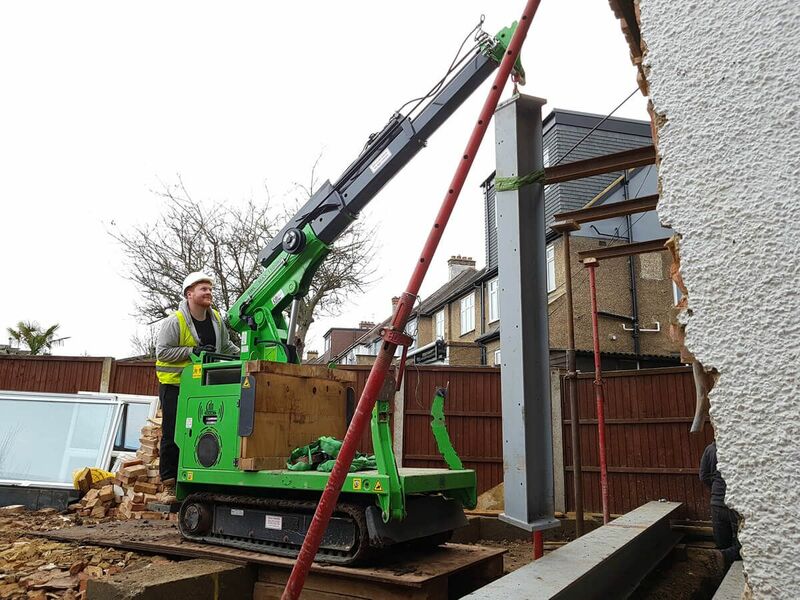 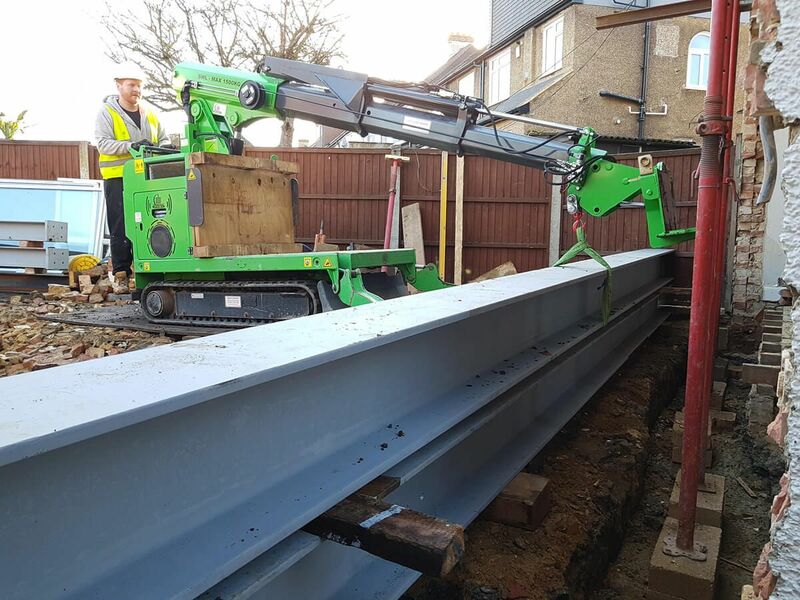 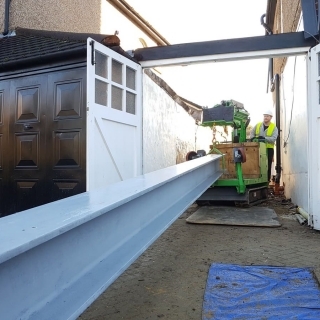 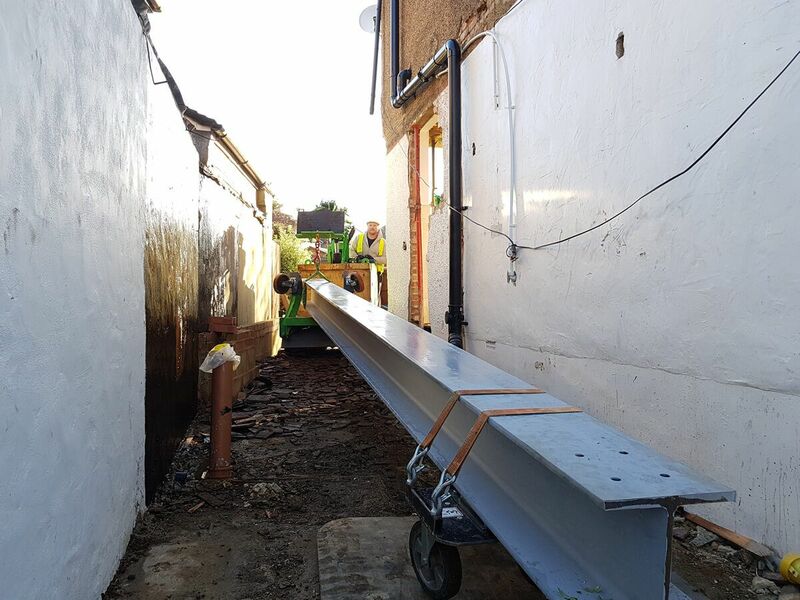 With two huge 7.6 metre long, 950 Kg beams making up a steel Picture Frame, this job required a machine that was able to safely lift, shift and install heavy steel beams through tight spaces. 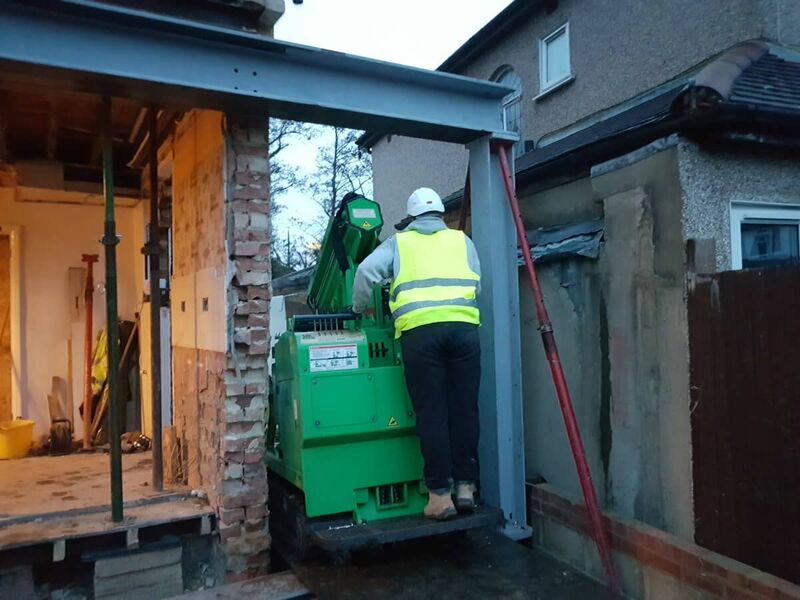 The Hooka de-stacked the pre-delivered RSJ I-beams onto its trolley system and towed them into site through the narrow access under the 2.1 metre high doorway frame. 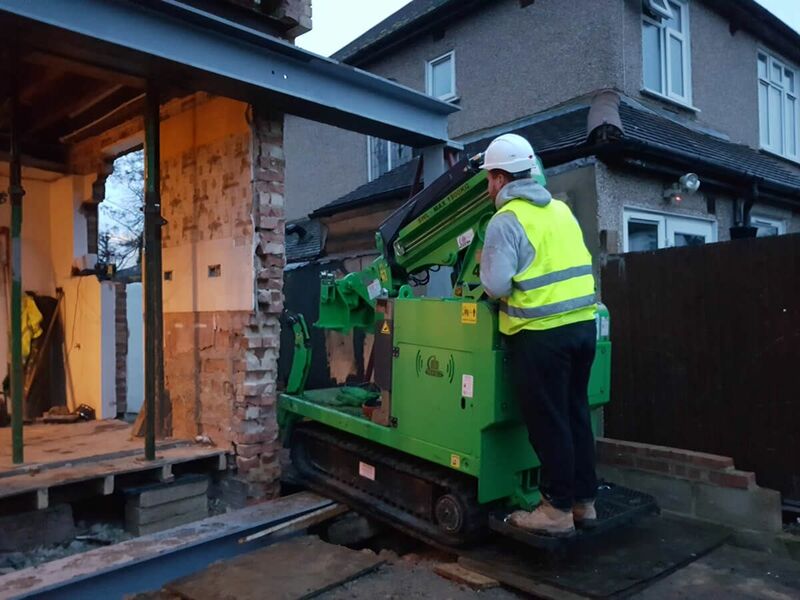 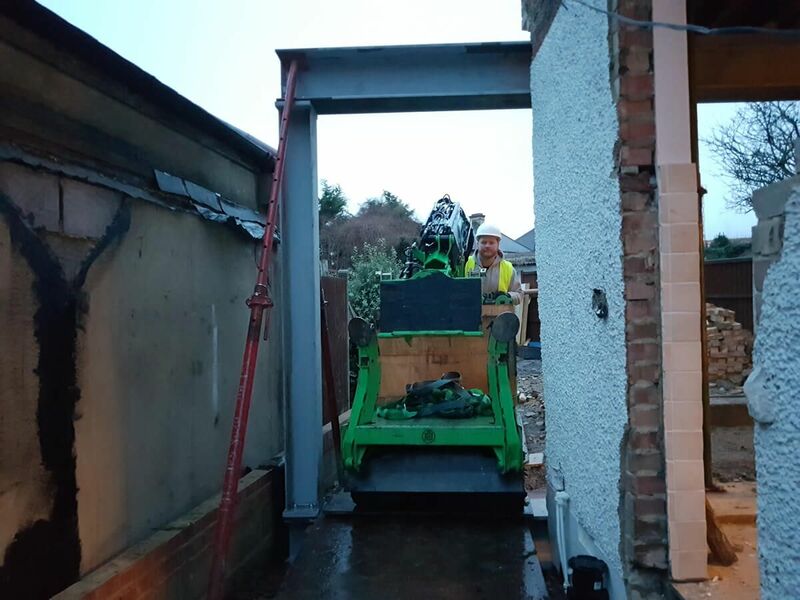 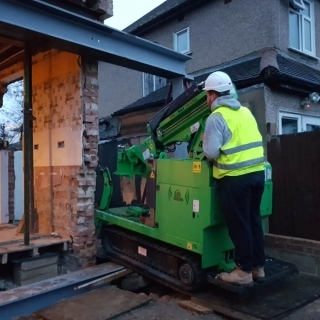 Despite the restricted space in the garden, the Hooka was able to bring the large RSJ’s into site and set them in front of the opening ready for lifting into place. 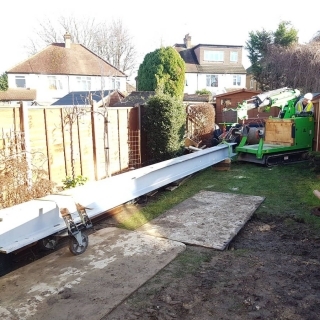 A pre-made concrete ring beam presented an additional access challenge for installing the large steel beams, but the Hooka’s lightweight and stable rubber tracked base allowed the straightforward set up of a sleeper based table to provide the perfect operating platform. 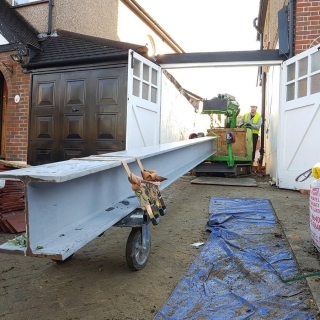 With the two heavy steel RSJ I-Beams stacked safely in front of the opening, the acroprops were shifted along their needles to make room for the install. 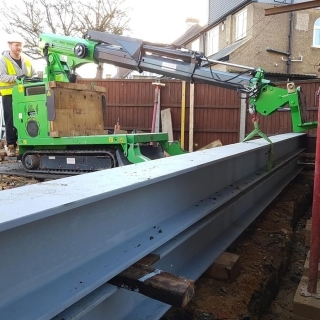 The machine was then able to lower the 950 Kg bottom steel beam down into the foundation trench and onto its datum plates. 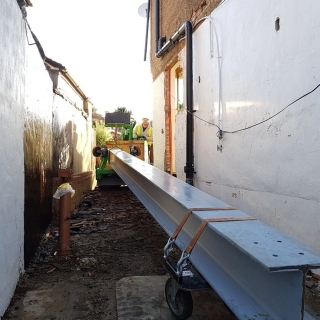 Next, the Hooka carried the two upright RSJ columns in and set them vertically onto the bottom steel beam, so they could be walked the last 100mm into position. 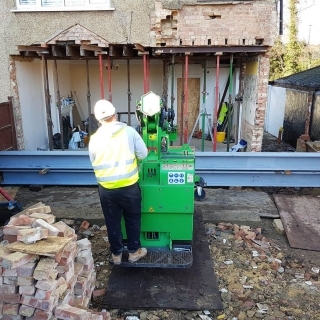 Once the steel columns had been bolted in place, the machine then lifted the 950 Kg upper I-Beam onto the top of the uprights, so they could be bolted together. 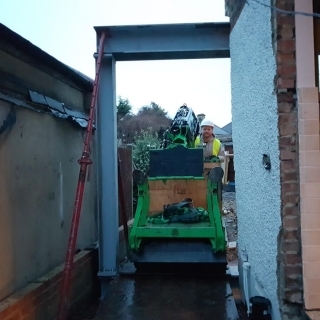 With the steel Picture Frame assembly complete, the Hooka then had the challenge of getting out of the rear garden of the property. 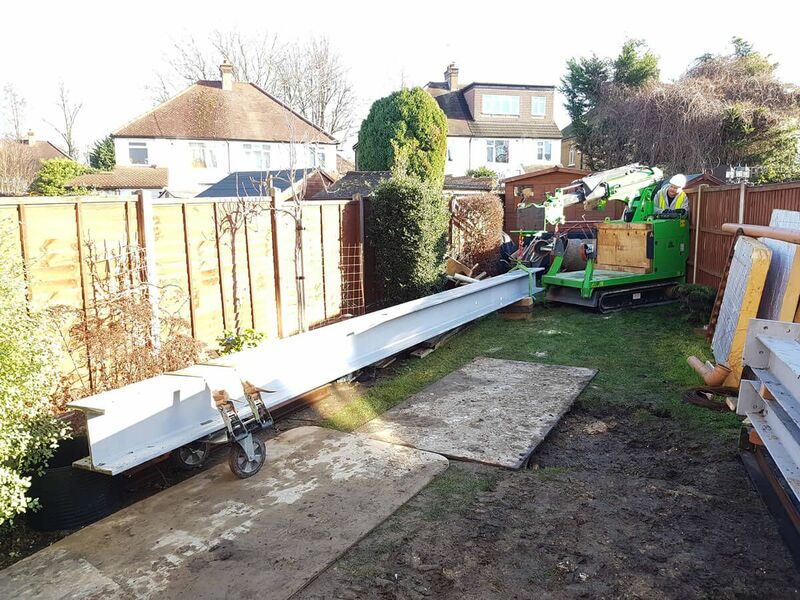 As the steel assembly occupied the full width of the plot, the Hooka had no choice but to escape through the frame it had just erected! 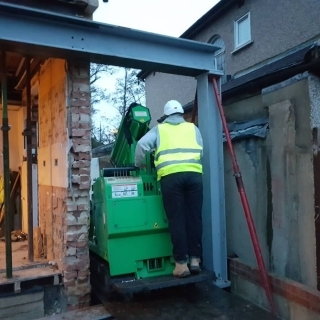 Fortunately at only 1 metre wide, and just over 2 metres tall, the compact crane was soon on its journey home. 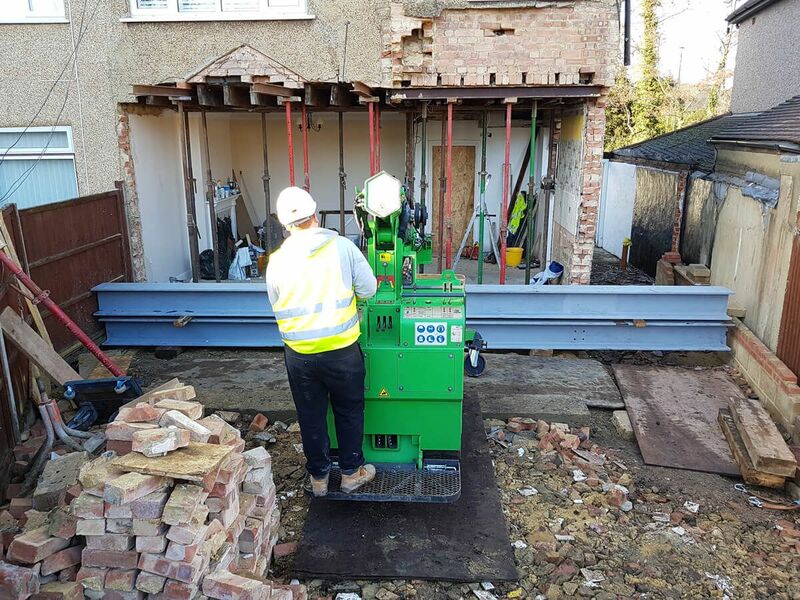 Our specialist operators will take the stress and danger out of installing your steel beams with the Hooka. 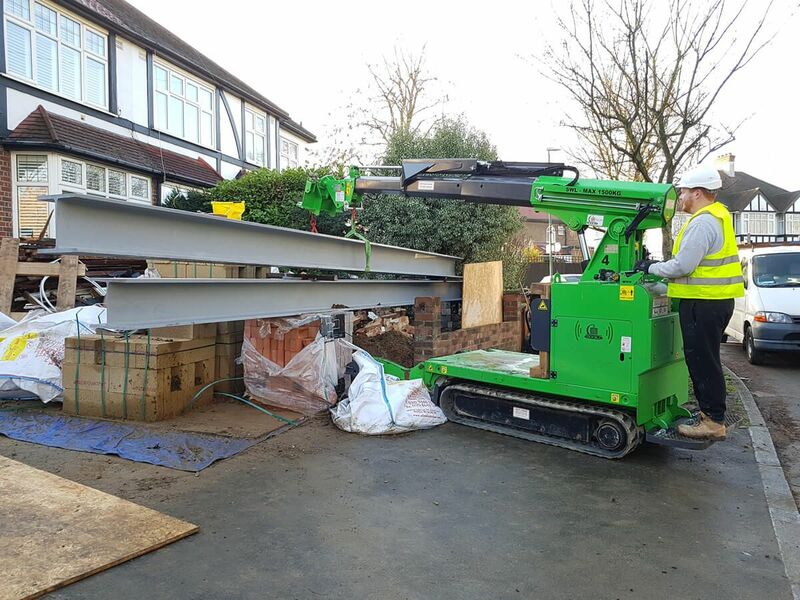 Lifts and carries steel beams from the roadside into the heart of any site! 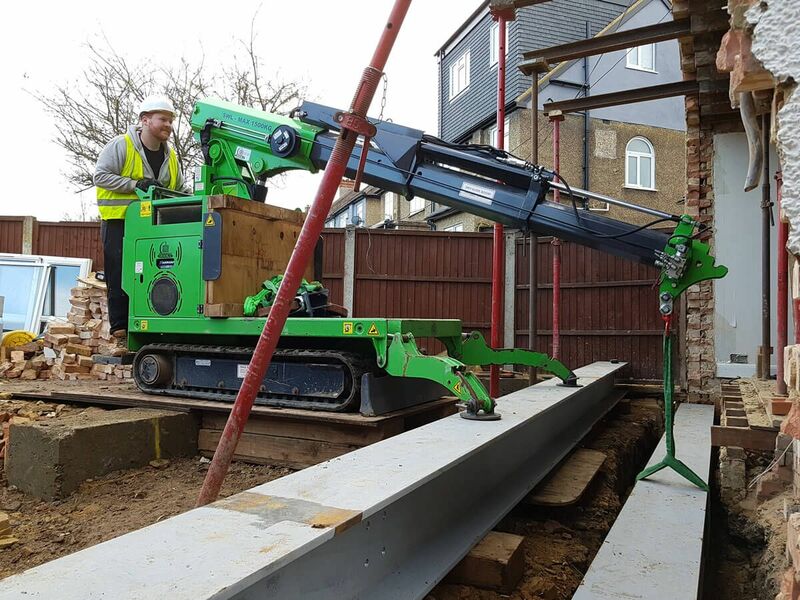 Safely lift and carry steel beams of up to 1.3 tonnes. 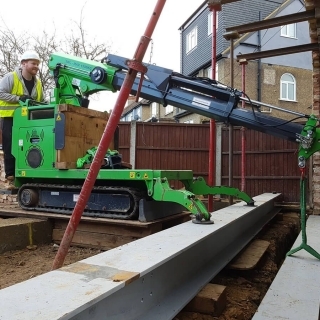 With it’s specially designed Steel Beam installation attachment on the crane jib, the Hooka makes moving and installation of steel beams easier than ever before. 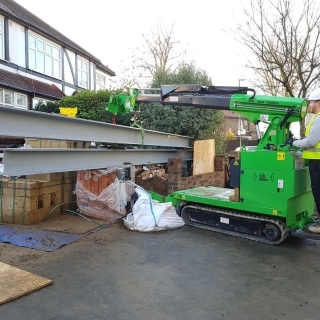 Below you will see examples of the Hooka quickly, efficiently and safely helping with the installation of steel beams up to 1.3 tonnes each. 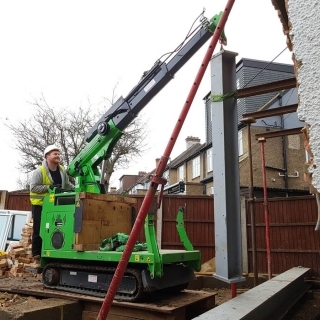 Plus with it’s stable platform and long reach, the Hooka can place steel beams exactly where they are needed, unlike traditional hoist-up beam lifters.